The 2012 USDA Census revealed that the 16 counties comprising the Eastern NY Commercial Horticulture program had over 12,500 acres devoted to apple production. The lower Hudson Valley region and the Lake Champlain region are two of the largest and most important apple production areas in New York state which ranks second in the nation for apple production and first in the country for canned apple products, although much of that crop is produced in western NY. Apples are thought to have originated between the Caspian and the Black Seas and proof of humans’ enjoyment of apples traces back at least 750,000 years. Early settlers brought apple seeds with them to the United States. Records indicate that apples were grown in New England as early as 1630. John Chapman, also known as Johnny Appleseed, along with many other traders, missionaries and Native Americans, were responsible for extensive apple tree plantings in the Midwest and beyond. Apples are one of the most valuable fruit crops in the United States. The 9.0 billion pound U.S. 2012 apple crop was valued at nearly $3.1 billion. 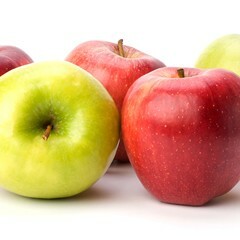 Apples are the second most consumed fruit (fresh and processed uses combined), following oranges. The average person consumes 44 pounds of apple products annually. Over the last 20 years, Cornell research and extension projects have helped growers increase yields and fruit quality by increasing tree densities and improving labor efficiency. We estimate that profitability of new high density orchards is 100 to 300% greater than the traditional low-density orchards. In 2013, Cornell University announced the introduction of two new apple varieties, SnapDragon and RubyFrost, developed through a managed release partnership with the New York Apple Growers (NYAG). The income generated through this partnership is used to market the new varieties and support Cornell’s apple-breeding program. For more information about tree fruit production, please visit the Cornell Tree Fruit website at http://www.fruit.cornell.edu/tree_fruit/index.htm. Cold injury is a concern for apple production in Eastern New York, where extremely cold mid-winter temperatures and dramatic temperature fluctuations in the late fall and early spring are not uncommon. Let's review the types of cold damage we might expect to see in rootstock tissues, and discuss which rootstocks might be most appropriate for dealing with the cold in a high density production system. These videos describe two different methods for grafting apple trees.